How many times have you wondered what the best way is to send money back home to pay fees, and been anxious about the exchange rate or transaction fees? Or been so caught up in the diaspora juggle that the payment date creeps up on you? Next thing, you’re scrambling to get fees to the school to avoid your child or relative being excluded from school or sent home on day 1 because the school has no record of payment. When you do send money for fees way ahead of time, there’s also that awkward scenario where it ends up being used to tackle some more immediate bills, which means finding more money for the same fees once inevitable term time comes around. Do you risk upsetting your middle (wo)man by substituting them with another one? Or keep hoping your hard earned money gets to where it needs to when you need it to get there? If at any point, you were nodding your head, then you’re going to love the genuine game changer that is the Zympay Schools Direct product! After announcing its partnership with ZB Bank, one of Zimbabwe’s leading financial services institutions on 5th July 2018, Zympay is all set to transform your ‘Back to School’ experience from now onwards! It would seem that Zimbabwe is the perfect stage for this scene to play out too, since according to EcoBank Research, in terms of mobile banking, Zimbabwe is the Southern African region’s surprising leader in Mobile Money – 49% of adults have Mobile Money accounts (World Bank Financial Index). Speaking about this latest addition to Zympay’s ever expanding portfolio of products and services designed with Zimbabweans – home and away – in mind, Dakshesh Patel, CEO of Zympay said, “If you look at the knowledge, experience & appetite for innovative problem solving in Africa & in the diaspora, there are many reasons to be excited! With the right collaboration, we can transform banking & payments in Africa, and use contemporary technology to elevate not just individuals and institutions to the inclusive financial growth the continent as a whole urgently needs”. So what is Schools Direct? Put simply – because it really is wonderfully simple – it’s a #BetterWay for you to pay school fees from anywhere in the world, directly into the account of any Zimbabwean schools, colleges or universities that are on the extensive Zympay platform. Say goodbye to the middle (wo)man, to transaction fees – yep, no fees! You pay just the amount you want to send. Say hello to knowing exactly where your money is going, and being able to make payments right from your mobile device or PC. You have all the control literally in your hands. If the institution in Zimbabwe is one of the thousands that bank with ZB Bank, then they will be offering this service right now. “Today, Africa is home to more digital financial services deployments than any other region in the world, with almost half of the nearly 700 million individual users worldwide. Mobile money solutions and agent banking now offer affordable, instant, and reliable transactions, savings, credit, and even insurance opportunities in rural villages and urban neighbourhoods where no bank had ever established a branch. This is, quite literally, banking at your fingertips – for everyone. It is revolutionary.” Reeta Roy, President and CEO Mastercard Foundation via Digital Access: The future of Financial Inclusion in Africa. Thanks to the partnership with Gain Cash & Carry, another home grown Zimbabwean brand supporting local products and suppliers, there’s so much more to be gained from using Zympay. For every $1 paid in school fees, the school gets a gift of 10% to spend at Gain. So you send $100 and GAIN will gift the school with $10 they can spend on food supplies for their school kids! Your loved ones get a free 50% GAIN gift voucher. Now that is value for all. There’s no good reason not to #GoBig on innovation with Zympay, ZB Bank and Gain. Signing up for this service which is available right now is quick and easy. 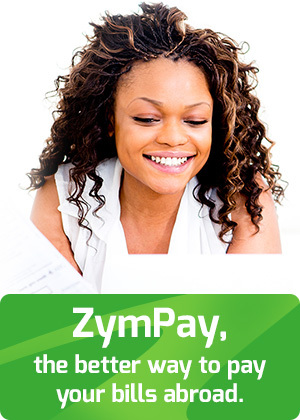 Visit www.zympaydirect.com/register and take advantage of the many products and services which have been designed with you and your needs in mind. If you’re in London on 11th August 2018, Zympay is one of the sponsors of ZimFest at Kempton Park Racecourse, and will be on hand to talk through their products and services. If you can’t make it, visit Facebook, Twitter, LinkedIn or of course, just take a look at the website. At a time when there’s so much conversation about Africa’s digital innovation and the emergence of disruptive technologies to tackle its greatest challenges, it’s extremely exciting and encouraging to see fintechs like Zympay who are delivering beyond the talk.